A BioBlitz is an event that focuses on finding, identifying, and recording as many species of plants, animals, microbes, fungi, and other organisms as possible in a specific area over a short period. It is a race against time! Our goal is to record all the plant and animal species that live on the SBA campus in 6 short hours. Our preschool through 12th grade students will investigate and record the species with the help of many specialists who will be on campus. Students are required to dress in Spirit Day attire, appropriate for the weather of the day. Invaluable outdoor learning experience for our students. The data we collect will help to generate a master list of plant and animal species that exist on our campus. This list will be shared with scientists who can use the data to support biodiversity conservation and research. Summer will be here before you know it, so we want to be sure you have a safe, engaging summer camp experience for your children here at Silverdale Baptist Academy! Whether you’re looking for camps in academic subjects, sports, art, and more, our complete camp offerings can be found online at www.silverdaleba.org/summercamps. Check out our brand new camp website, create an account, then register and pay online all in one place! Be sure and help us spread the word about the variety of camps being offered, many of which are open to the public. 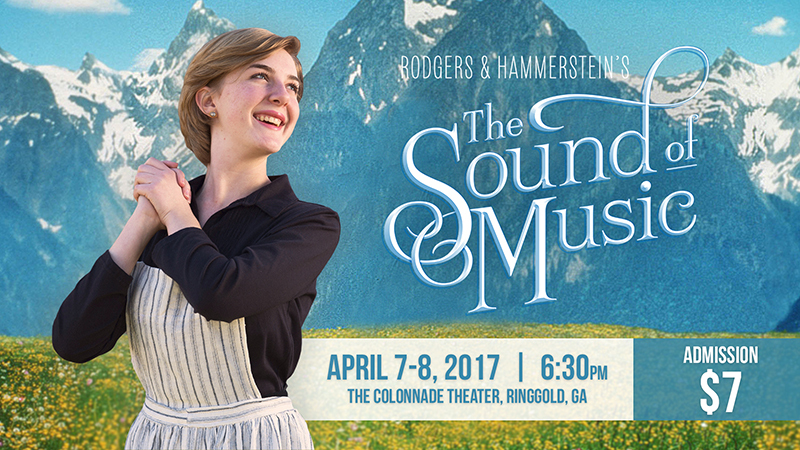 The high school drama department will present The Sound of Music Friday and Saturday, April 7-8, 2017 at The Colonnade Theater in Ringgold, GA. Admission is $7 for students and adults. You won't want to miss this musiclal, so make plans to attend, and purchase your tickets through the elementary or upper school receptionist desk. They will go fast! Feeling overwhelmed? Exhausted? Having to keep up the facade that you have it all together? Stop, breathe, and let’s get real. Starting March 29th at 8:15am in the Silverdale Chapel, we moms are going to begin a 5-week bible study to recover our contentment in Him. Reconnect with Him and become real with other moms that are walking this journey with you. You are not alone. We can fellowship from 8:00-8:15am every Wednesday and then begin our study together. Mom led. Moms ready for authenticity. Moms eager to grow together in Christ. 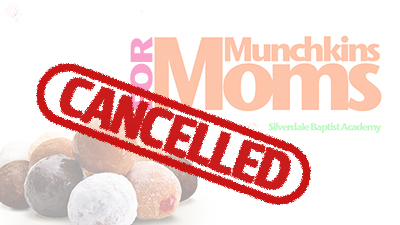 Muchkins For Moms previously scheduled for April 11th has been cancelled due to our all day first-of-its-kind BioBlitz taking place at Silverdale that day! You can read more about this exciting event above, and more information will be coming home with your student as the event draws closer. EMPLOYMENT OPPORTUNITIES: Check our website often for job postings for the upcoming school year! Currently, Before & Aftercare, Elementary, Middle, and High School are all hiring! PLEASE NOTE: In the event of a delay of school for any reason, there will be NO Early Birds services provided. Please make arrangements to arrive no earlier than 30 minutes before the designated start time, as indicated on your phone message, email, and social media outlets. The safety of students, parents, faculty, and staff is our top priority. For questions, contact Kelly Walden, Early Birds & Night Owls Director. FINANCIAL INFORMATION: If you have questions contact Angie Howard at extension 2225 or by email or Pam Riley at extension 2226 or by email. Don’t miss a beat in the world of tuition and finance – check the Financial page on the Parent Portal for current information. ACADEMY MASTER CALENDARS: Check Academy dates for vacation, holidays, etc – the school’s master calendar for 2016-2017 and 2017-2018 are available on our website. April 20th-21st: Middle School Drama: "Junie B Jones is Not a Crook"
Spring Semester Field Trips: Please see your child's teacher for details. All students MUST have at least one adult chaperone to transport and accompany them off campus. Cash payments only for Field Trips. Spring Individual and Class Pictures: Thursday, April 6th and Friday, April 7th - Your child will be photographed on the day that corresponds with their enrolled days. If your child is enrolled 5 days, please see the office to find out their day. New Life Parties celebrating Easter: Wednesday, April 12th and Thursday, April 13th - 3 to 5 Year Old classes will celebrate Easter with New Life Parties beginning at 11:00 am. Please see your child's teacher or homeroom mom for details. Preschool Closed for Good Friday: Friday, April 14th. No childcare. We pray you have a blessed weekend celebrating the resurrection of our Savior! HELP! Coach Neighbors is looking for volunteers to help with the Spring Coke Sale. If you are interested, please email him. Middle school cheerleading tryouts will be April 3-7, with more info coming soon. For questions, email Coach Bates. Middle School Cheerleading Tryouts: Clinic: Monday, April 3 3:30-5:30 (mandatory parent meeting 5:30 P.M.) Tuesday, April 4 3:30-5:30. Thursday, April 6 3:30-5:30. Tryouts: Friday, April 7 3:30. ••All dates are mandatory.•• For more information, see Coach Kim Bates or contact her by email. BOOSTER MEMBERSHIP: Sign up to be a booster member here. For questions or more information about becoming a booster, email Tiffany Givens.